Naturally cloudy we allow the yeast to remain in the bottle to enhance fullness of flavors, which cannot be duplicated otherwise. Expect this ale to be fun, fruity and satisfying. 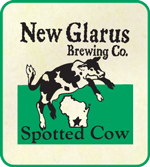 You know you're in Wisconsin when you see the Spotted Cow.